A young research location, Luxembourg’s first centre for research opened in 1987. The FNR was created in 1999, followed by the University of Luxembourg’s opening in 2003. 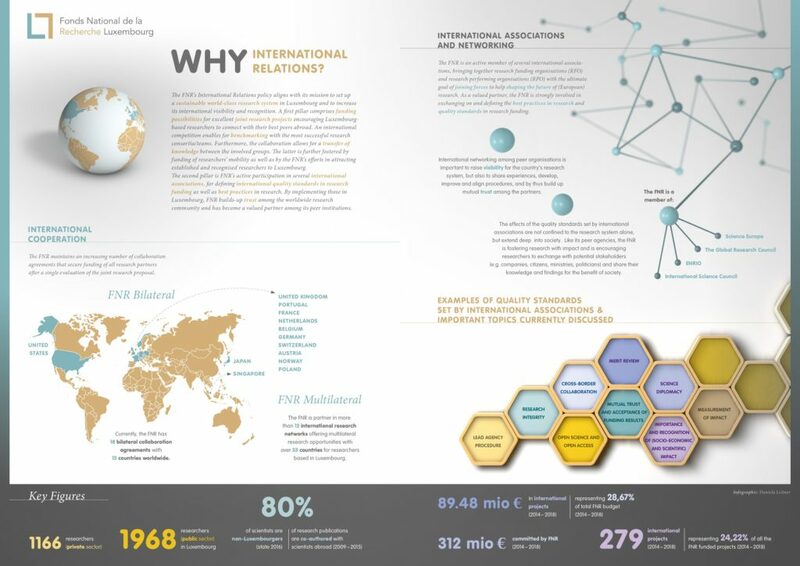 Luxembourg is increasingly establishing itself as a research destination and putting itself on the international research map, and in 2006, we launched the INTER programme – our umbrella for our international cooperation opportunities. The INTER programme is our instrument to provide co-funding for international research collaborations between scientists in Luxembourg and abroad. We have lead agency agreements with 18 different foreign partners to support bilateral projects between researchers based in Luxembourg and abroad – view the partners here. These agreements make it possible for Luxembourg-based researchers to conduct bilateral research projects with researchers based in 12 different countries – view the countries here. Joint research projects will be evaluated by one agency only (lead-agency agreement). For bilateral projects with the DFG (Germany), the FWF (Austria), FCT (Portugal) and SNF (Switzerland), whether the FNR or the foreign funding agency is the lead agency is determined by where the main research effort is accomplished. For the EMBL (Germany) and NCBR (Poland), FNR always evaluates joint proposals. For all other bilateral projects, the foreign funding agency is generally the lead agency. Bilateral projects where the FNR is the lead agency must comply with the rules of the CORE programme. The FNR is part of more than 8 international research networks offering multilateral research opportunities with over 35 countries for researchers based in Luxembourg. These include EUROSTARS and various European Research Area (ERA) networks. In addition to the proposal submitted to the foreign funding agency, Luxembourg applicants have to submit to the FNR the documents associated with the FNR’s INTER programme. In cases where the FNR is not the lead agency, this must still be done no more than 5 days after the lead agency deadline, via the FNR Online Grant Management System. Please note, Luxembourg-based researchers applying for bi and multilateral projects where the FNR provides funding must always submit call documents to the FNR as well. Financial information about what is supported is available in the INTER guidelines.